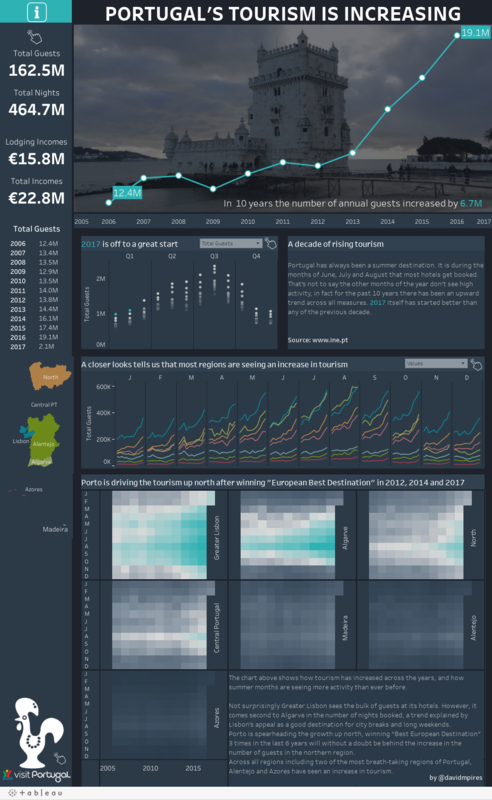 Announcing our Iron Viz: Europe Winners! Want to check out all the entries to Iron Viz: Europe? You can see them all here. Want to get notified when we launch out next Iron Viz contest? Register your interest and we'll let you know as soon as we launch our next contest! C'est Magnifique! Europe, we asked you to show us your Iron Viz best for the first regional Iron Viz contest, and you answered in style: with 26 fantastic entries. #ironviz at #data17 in London is going immense. Can't wait to see the best of Europe battle it out. I'm pretty sure we can out Vegas Vegas. Athan Mavrantonis explained the Dutch elections in a storypoints tour de force. Jonathan Trajkovic looked at the trends in the 1st round of the 2017 French presidential elections. David Pires made us all want to go to Portugal for our next holiday with his viz about Portuguese tourism trends. We are having slight issues rendering David's viz properly - this show be fixed soon. Finally we have an Honourable Mention to Annabelle Rincon who won all our hearts with her brilliant storytelling about a little mouse in search for cheese. Once again a huge congratulations to our three winners, and another round of applause to all the contestants for your amazing work. Athan, Jonathan and David we'll see you on stage in London! There are still tickets available if you want to see Athan, Jonathan and David battle it out live on stage at 2017 Tableau Conference on Tour London, UK).